Why not read Jeremy Corbyn's "red rag" speech for yourself? On Tuesday February 20th 2018 Jeremy Corbyn gave a speech to the EFF confederation of British manufacturers about Labour's economic strategy. 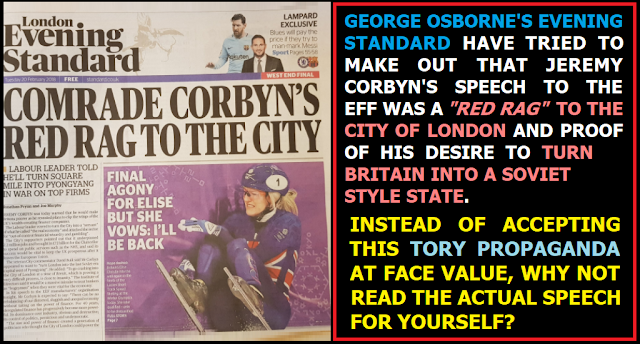 The response of the Evening Standard (edited by former Tory Chancellor George Osborne) was to publish a front page hatchet job describing the speech as a "red rag" to the City of London, and Jeremy Corbyn's economic strategy as a plot to turn London into "the last Soviet era city west of Pyongyang". Shockingly hundreds of thousands of Evening Standard readers will have uncritically accepted this ludicrously hyperbolic appraisal of Jeremy Corbyn's speech without even referring to the source material and judging it for themselves. Britain was the birthplace of the industrial revolution and many great inventions from the cash point to the jet engine. Manufacturing continues to punch way above its weight accounting for 10% of output, but 44% of exports and a massive 70% of business investment in research and development. Output per hour is £4 higher in manufacturing than the average for all sectors and the average annual earnings of someone working in manufacturing are nearly £4000 higher than average earnings from across the whole economy. I know from my childhood the value of manufacturing jobs. My dad had one, as an electrical engineer who worked successively for Westinghouse, English Electric and GC. He enjoyed good, satisfying work with decent pay. The contributions of manufacturing of all of you to our economy cannot be understated, and the case for supporting more manufacturing jobs and industries is undeniable. And yet for too long Government hasn’t done enough to support you. Businesses are crying out for infrastructure investment. We are lagging behind other leading countries, but the Government simply isn’t delivering. That’s why we have pledged to create a National Transformation Fund to upgrade our transport, energy and digital infrastructure so that it is worthy of the 21st Century. We must also invest in our people as well as our physical infrastructure. We have, on the one hand, university graduates who can’t find a suitable job while thousands of underemployed workers can’t get the skills they need to advance. And on the other hand, businesses are struggling to recruit workers with the right skills. Time and again, businesses tell me how difficult it is to hire employees with the skills they need. And that far too often school leavers are unprepared for the workplace. Life-long learning Labour’s National Education Service will tackle that problem head-on, providing free, life-long learning to all, so that anyone can retrain or upskill at any point in their life. We will put vocational education, too often the poor relation of our education system, at the heart of the National Education Service ensuring that science and technical learning starts early in primary schools. Children should engage in practical learning from a young age not just in the classroom, but through play and activities. And we will build links with industry into the National Education Service, to make sure that our education system keeps pace with the changing needs of our economy, expanding the type of training that qualifies under the Apprenticeship Levy so that businesses can actually use it for the skills they need. The Tories’ approach to Brexit is threatening to turn our skills crisis into a catastrophe, especially for manufacturers who rely on recruiting skilled workers from overseas. Labour said from the start; we would give an unconditional guarantee to EU citizens of their right to stay in the UK. Not just now but during the transition period as well. This is not just because of the valuable role EU citizens play in our economy and in many of your businesses, but because they are people who have built a life here. Unlike the Tories, we will not use people, mothers, fathers, neighbours, friends as bargaining chips. Brexit is for many an emotive subject. But for business, it is first and foremost a practical matter. To make decisions about where, when, perhaps even whether to invest, you need to know what markets you will have access to, what regulations and product standards you will be subject to, who you will be able to recruit, what will happen to our supply chains, which we all know are currently integrated across many national borders. That’s why Labour has from the start taken the practical position of accepting the result of the referendum and insisting the economy must come first. We are leaving the EU, but our businesses must not withdraw from European markets. Business needs clarity and with four out of six of the Government’s “Road to Brexit” speeches already delivered, the Tories approach to Brexit is if anything less clear. It’s time for the Cabinet to stop fighting and the Government to say where it wants to take the country. And it’s not just in its approach to Brexit that the Government is failing to put the economy first. For too long manufacturing has been undervalued. For all their warm words, whether Osborne’s “March of the Makers” or this government’s new-found enthusiasm for the words ‘industrial strategy’ for decades now, the Conservatives have created, encouraged and sustained a system that rewards those who lend and speculate over those who make things. Thatcher’s progressive abolition of restrictions on financial trading culminating in the ‘Big Bang’ deregulation of 1986 placed the needs of speculative finance at the helm of British economic life. When Thatcher took office the ratio of private debt to GDP was 60%. In the 30 years that followed, that trebled. That increase wasn’t due to banks supporting a healthy and productive economy by lending to businesses represented here today. It was because banks started lending to households and inflating asset prices on a scale never seen before. At the same time, investment banks began trading new kinds of financial products, packaging up debt in increasingly opaque ways and becoming ever more removed from the real economy. Now let me be clear, finance has a central and essential role to play in a functioning economy. Without access to finance, how would the entrepreneur or business person just starting out find the means to get their idea off the ground? How would a growing company afford new equipment that will make their business more productive and more profitable? Or expand their activities by opening new premises? Finance is the grease that oils the wheels of our economy, and without it, economic activity would seize up. But when private debt is twice the size of the real economy, when traders no longer understand the products they are trading and banks are funding speculation, rather than productive investment, something has gone grossly wrong. Banks should be helping the real economy not suffocating it. Let me remind you of the words of John Maynard Keynes when he said: “There cannot be a real recovery . . . until the ideas of lenders and the ideas of productive borrowers are brought together again . . . . Seldom in modern history has the gap between the two been so wide and so difficult to bridge’. “ Keynes was writing about the Great Depression of the 1930s but the gulf between finance and the real economy may be even wider today. We know the results, money flows away from the productive activities that you are engaged in that create jobs and exports to instead inflate asset prices, concentrating money in the hands of a few owners, not producers, while households become more reliant on borrowing. And we end up with an economy with more risk, more volatility and more instability. It was a “heads I win, tails you lose” gamble for the banks, not my words, but those of the Governor of the Bank of England. And we’re all still paying for the inevitable crash. When the last Labour Government stepped in to shore up our major banks as they stood on the brink of collapse it prevented a total meltdown. But the public should have been given a say in how the banks, propped up by our money were being run. And there should’ve been a much more concerted effort to rein in banks’ speculation to refocus on productive lending. We need a fundamental rethink of whom finance should serve and how it should be regulated. There can be no rebalancing of our distorted, sluggish and unequal economy without taking on the unfettered power of finance. For forty years, deregulated finance has progressively become more powerful. Its dominance over industry, obvious and destructive; its control of politics, pernicious and undemocratic. The size and power of finance created a generation of politicians who thought the City of London could power the whole economy. Out of control financial wizardry and gambling were left barely regulated, while the real economies in once strong industrial areas were put into managed decline. The welfare state was left to pick up the slack with sticking plaster redistribution to the people and places held back by the finance-led boom of predominantly the South East of England. For a generation instead of finance serving industry, politicians have served finance. We’ve seen where that ends, the productive economy, our public services and people’s lives being held hostage by a small number of too big to fail banks and financial institutions. The next Labour Government will be the first in 40 years to stand up for the real economy. We will take decisive action to make finance the servant of industry not the masters of all. The reign of finance doesn’t stop at the gates of the City of London. Its extractive logic has spread into all areas of life with short-term performance and narrow shareholder value prioritised over long-run growth and wider economic benefit. Take GKN, one of the world’s oldest and most prestigious engineering firms with a big factory in Telford where I grew up. It employs 6,000 workers across the UK, contributes an estimated £1.3 billion to the economy, paid a healthy £174 million in tax each year and invested £561 million in Research and Development in the UK alone. And yet GKN is currently facing a hostile, allegedly debt-fuelled takeover bid by Melrose, a company with a history of opportunistic asset-stripping. It’s an all too familiar story like when Kraft took over Cadburys. A valuable company could be sacrificed so that a few can make a quick buck. We rightly praise the growth of companies like GKN and their location in the UK. And yet when we are faced with the possible destruction of that company, the Government refuses to act. That’s why the next Labour government will broaden the scope of the ‘public interest test’ to include explicit consideration of the needs of our economy taking advantage of new freedoms outside of the EU to allow Government to intervene to protect our industrial base. An important step towards reprogramming the economy, so that it works for the many, not the few. Reprogramming our economy; to reward good business practices, reining in speculative finance so that it serves – not distorts the whole UK economy – backed up by a strong industrial strategy, as well as investing in our physical infrastructure and our people. This approach is vital if we are to develop our manufacturing strength. That is what the next Labour Government is committed to working with you to achieve. Anyone with a grain of sense should be able to see that Corbyn isn't outlining a plan to abolish private industry or the financial sector, he's just calling for a better, fairer system that is geared more towards those who make things than those who recklessly gamble with other people's money. He's not saying there's no place for speculative finance, but that finance should be used to fund new businesses, new infrastructure, and better services, rather than for unregulated gambling on extraordinarily complex derivatives that even most of the traders don't even understand. You could see why city traders who have enjoyed four decades of enriching themselves at the expense of the real economy would object to any effort to get them to invest in the real productive economy rather than gambling away with impunity, knowing that they'll be bailed out by the taxpayer again whenever they next fail. But Corbyn's speech should be music to the ears of anyone who values the real economy above the selfish interests of a tiny clique of city speculators who see it as their right to live off the backs of the rest of us, and have us pay for their economic crises through austerity dogma while the government actually lavishes handouts on them. And even if you think that the interests of city speculators should trump the needs of the real economy, you'd have to be absolutely clueless to accept the idea that a call for more financial investment in private sector manufacturing is some kind of Soviet style communist plot. Sadly though, there are actually people thick enough to accept such brazen Tory propaganda at face value, hence eight years of ruinous Tory austerity dogma damaging the future economic potential of the UK, rather than anything even remotely resembling an actual plan to make sure the financial sector insolvency crisis can never happen again.